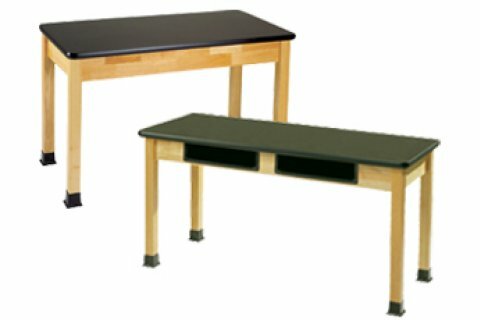 These Science Bio Solid Phenolic Top Lab Tables have chemical-resistant solid phenolic tops. They are highly impervious to most chemicals, acids, stains and moisture. Wilsonart Chemsurf chemical-resistant, laminated tops are resistant to most chemicals and stains, but have limited resistance to high temperatures and severe chemicals. 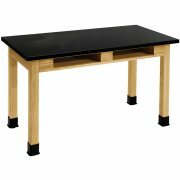 The 1 1/4" thick Chemsurf tabletop cleans easily and retains its finish over time. Chemical-resistant solid phenolic tops are highly impervious to most chemicals, acids, stains and moisture. These 3/4" tops are considered a superb lab surface material that measures up to the highest standards for tough use. 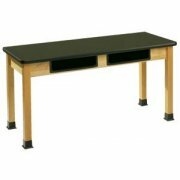 Solid Epoxy Resin tops are considered the absolute best material for use in serious science laboratories. Epoxy Resin is completely impervious to most chemicals, acids, normal laboratory heat and moisture, showing no effects when subjected to the following chemicals: Hydrochloric Acid 20%, Sulfuric Acid 60%, Methyl Alcohol, Nitric Acid 70%, Benzene, Toluene and many more. 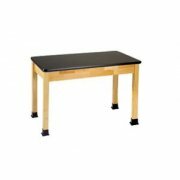 Black phenolic top is 3/4" thick, with eased edges and rounded corners for safety. Solid hardwood legs and apron. 2 1/4" x 2 1/4" legs. Black rubber boots protect legs from acid spills.